Thanksgiving has me all excited. I’ve been awfully quiet over here, but I’ve been a very happy vegan lately despite my lack of blogging. We’ve been giving ourselves days off (can you imagine?) to cope with all our stress and it’s been great. Sleeping in, and spending time with friends has felt incredible. Unfortunately, I’ve started feeling pains in my back, arms and hands from stress and too much time at the computer. To relieve the pain I’ve been adding yoga stretches to my morning routine. That’s nice too. What else is nice? A Vegan Thanksgiving. Here’s what I have planned. We had a very successful shopping experience at Whole Foods this evening. We bought Vegan Cheese for a Layer Dip my Mom is making, Stuffed Turk’y, Vegan Stuffing, ingredients for my Green Bean Casserole, Vegan Coconut Ice Cream, and a Vegan Pumpkin Pie. They didn’t have any Vegan Pies on display so I asked if any were available, ten minutes later my Pumpkin Pie was brought to us from the back. The guy helping me had gotten distracted and decided to give us the pie for FREE! Yeah, Pumpkin Pie. We’re taking the Pie over to my in-laws along with the Coconut Ice Cream, Stuffing, and Turk’ys. The Casserole and Banana Nut Muffins are for my family along with Homemade Mashed Potatoes. This year won’t be a triple threat like last year, but it’s still two Thanksgivings in one day, now that’s something to be thankful for. Get The Vegan Stoner Green Bean Recipe here. Get my Banana Nut Muffin Recipe Here. 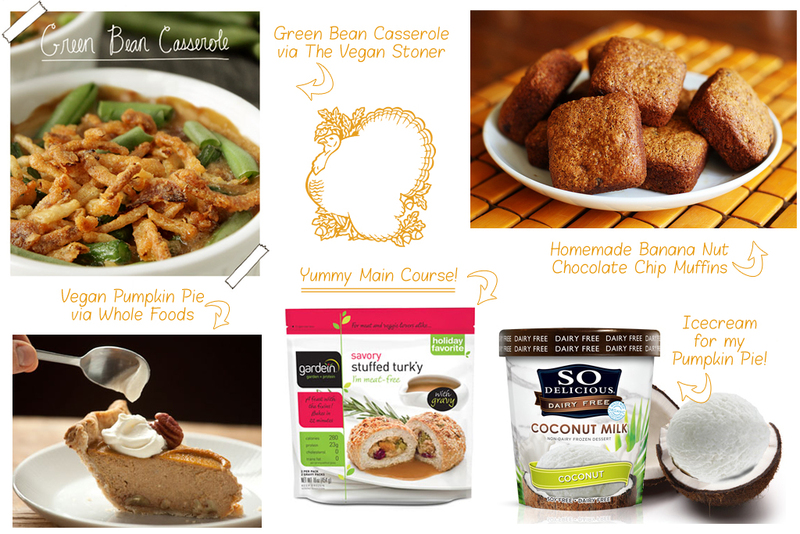 This entry was posted in Celebrations + Holidays, Vegan Product Reviews. Bookmark the permalink.